After a record-breaking 251 start-ups from 53 countries applied to be part of The Pearse Lyons Accelerator, the class of 2019 has been selected to work with Alltech and Dogpatch Labs to accelerate their business development. This year"s applicants have already raised over US $143 million, with 135 start-ups disclosing funding. 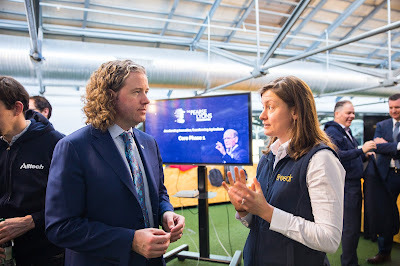 Now in its third year, The Pearse Lyons Accelerator was the brainchild of the late Dr Pearse Lyons, who founded Alltech, an animal nutrition company, in the early 1980s in his garage with just $10,000. "Through The Pearse Lyons Accelerator, we carry on my father"s legacy, his entrepreneurial spirit and his desire to empower the next generation of entrepreneurs to contribute to a planet of plenty," said Dr Mark Lyons, President and CEO of Alltech. "At SomaDetect, we can instantly detect every compound in raw milk with our in-line sensor," said Bethany Deshpande, CEO and co-founder of SomaDetect. "Our technology can be used to track the impact of premium nutrition on dairy cows and help detect issues like mastitis, which is a major pain point for dairy farmers. We are excited to have the opportunity to collaborate with Alltech, one of the leading animal nutrition companies in the world."